I attended a "Ten Years After" concert in 1971 in Durham, NC. Believe it or not, their OPENING band was "Yes" I went with my drummer boyfriend and some of his friends. We all dropped acid before hand. No one had ever heard of "Yes" at the time, but WOW were they great. Because of the acid, though, I was so overcome with awe during the "Yes" set that when the intermission came and everyone was running to the bathrooms before TYA started, I completely forgot about "Ten Years After" and thought the concert was over and tried to leave. Fortunately, my boyfriend stopped me. At the time, I was a junior at Jordan High in Durham, and that night was espescially magical because it was the first real date my beautiful girlfriend and I had (we were together for several years). I'd heard of Yes, having seen Chris Squire's advert for Rotosound strings in Guitar Player Magazine, which pictured the entire band - in the issue featuring Ten Years After's Alvin Lee, BTW. (Unfortunately, I'd missed an earlier issue containing an interview with Steve Howe.) Yes opened the concert and blew everyone's minds! I knew none of their music, but was taken mightily by this tour-de-force, and copies of "The Yes Album" and "Fragile" turned up in our hands shortly thereafter. Being seated in the rear of Cameron Indoor Stadium, my visual impressions were of the group as a whole, but Rick Wakeman was most clearly visible. Caught up in the whirlwind, the audience wildly brought Yes back for 3 encores! Unfortunately, my girlfriend had to leave during intermission, but overall, those encores were the denouement to the evening; later, Leo Lyons, who was playing bass through 2 Marshall 100W. stacks, apparently blew his amps during his solo, an insurmountable problem for the rest of the night, which knocked the legs out from under TYA... Suffice it to say - that concert truly changed my life, both as a musician, and on a deep personal level. Thanks, guys! Allman Brothers and many more in this great era of music. I was 14 yrs. old at the time and lived in Durham while Dad finished his PHD at Duke. Tens Years After was fantastic and Yes was especially wonderful. Rick Wakeman was amazing. In Cameron Indoor Stadium, I could go into the seats that crossed behind the stage and I spent a most of the time just watching Rick Wakeman "multi-tasking like crazy" with all those controls and keyboards. Memory might be a bit fuzzy, but I've got this image of Rick surrounded by a wall of switches and knobs, etc. and he was reaching in all directions helping to make those masterpieces happen. I think they played one of the songs from Close to the Edge that night. I recall sitting to the (performers) right side of the stage and watching the guy in Ten Years After playing the hell out of a set of large conga drums.... they put a killer jam. Seems corny now, but everyone lit a match --or something-- prior to both bands playing. 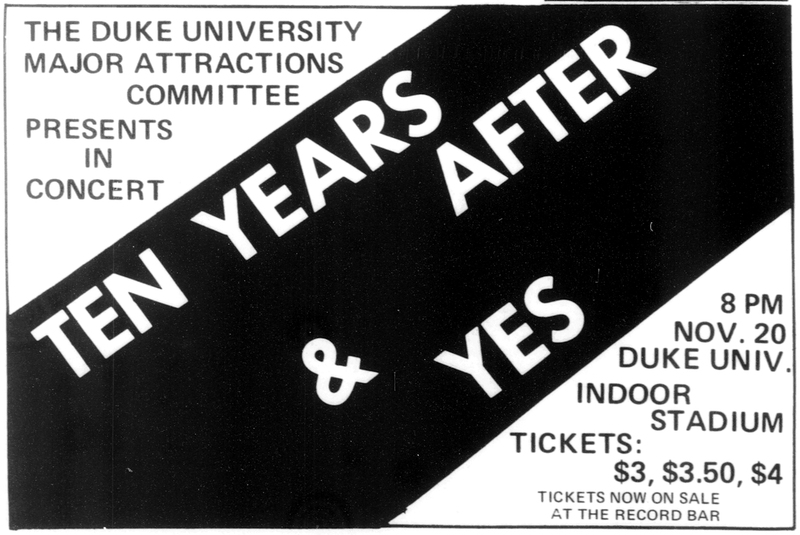 There were some great concerts at Duke back then. I went to see Ten Years After. No one had even heard of Yes. When we left we had forgotten TYA. The performance was like nothing I had ever seen. i have been a big fan since that evening.